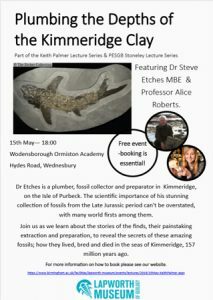 Rockwatchers may be interested to go to a talk on Plumming the Depths of the Kimmeridge Clay. It’s part of the Keith Palmer Lecture Series & PESGB Stoneley Lecture Series. The talk will be given by Dr Steve Etches MBE & Professor Alice Roberts. Find out more on the Lapworth Museum website or download the event flyer. Venue: Wodensborough Ormiston Academy, Hydes Road, Wednesbury.